Indonesia gets her name from the words “Indus” (the name of India) and the Greek word “nesos,” which means, islands. The name was coined in the 18th century by James Richardson Logan who was a student of English ethnologist, George Earl and used Indonesia as a synonym for the Indian Archipelago. Indonesia is located in South East Asia. She is bound by Malaysia and the South China Sea to the northwest, Papua New Guinea to the east, the Pacific Ocean to the northeast and the Indian Ocean to the southwest. Indonesia has been described as a gargantuan tree with many branches. She is the largest archipelago in the world. The country is made up entirely of islands, some 17,000 of them and they stretch over an area of 3,200 miles, from east to west. About 6000 of the islands are inhabited. Sumatra and Java are two of the largest Islands in the archipelago. Jakarta is the capital city, the largest city and located on the island of Java. The beautiful, tropical island of Bali is sometimes referred to as the tourist capital of Indonesia. Indonesia is the fourth most populous nation on earth, with over 257 million people. Java holds the majority of the population, over 51 percent, and is the most populous island on earth. Indonesia is also home to the largest population of Muslims in the world, with 87 percent of the population practicing Muslim. The government only recognizes six religions, Islam, Hinduism, Buddhism, Protestantism, Catholicism and Confucianism. Every citizen must officially declare their religion whether practicing or not and two individuals that want to marry must belong to the same religion or one must convert. Indonesia has a rich and fascinating history. Each island has its own unique, cultural background. The majority of the population is made up of Austronesian people, who originally migrated to South East Asia from Taiwan around 2000 BC. They began pushing the indigenous people to the far eastern regions. During the sixth and seventh centuries, the Srivijaya Kingdom and the Majapahit Empire were basically world powers in trade and in bringing Hindu and Buddhist influences to the area. They also brought cultural influences from India, China, and mainland Southeast Asia. These dynasties left behind several grand, religious monuments such as Buddhist Sailendra’s Borobudur and Hindu Mataram’s Prambanan, both of which are UNESCO World Heritage sites today. Although Islamic influences began in the eighth and ninth centuries, it wasn’t until the 13th century when Marco Polo visited Northern Sumatra, where he found already established Islamic states. Other areas of Indonesia gradually adopted Islam and it became the dominant religion by the end of the 16th century. 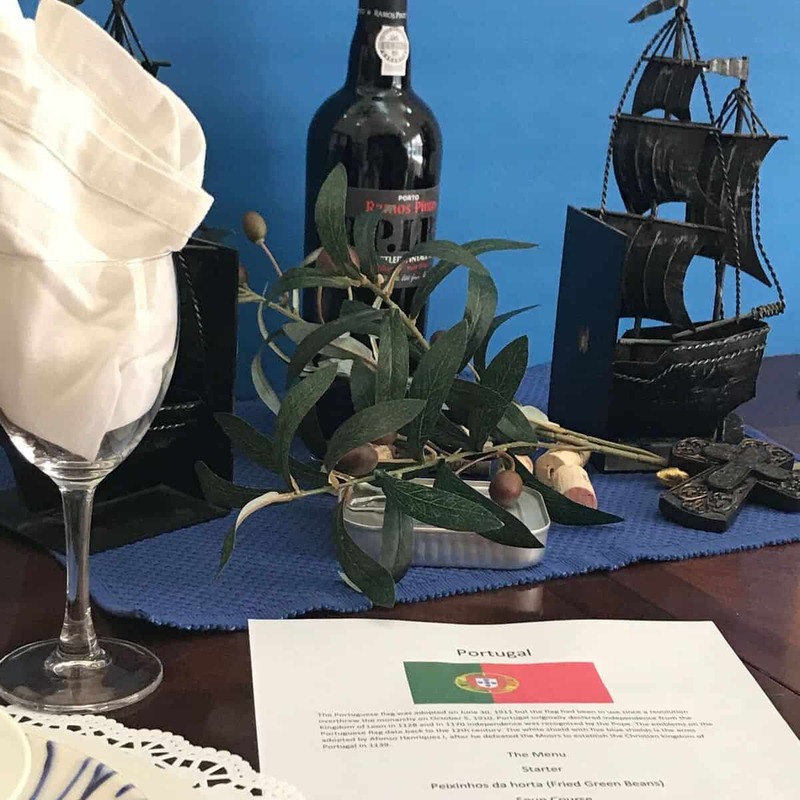 It was around this time that Indonesia’s abundant resources, particularly spices, began to attract the attention of the Europeans, especially the Portuguese. Spices were as good as gold, as they were believed to cure everything from the plague to many other diseases. The Portuguese were followed by the English and the Dutch. It was eventually the Dutch who won and colonized the area. The Dutch East India Company, established a spice monopoly that lasted well into the 18th century. After the dissolution of the Dutch East India Company, the Dutch began cultivating sugar and coffee on the island of Java, providing three quarters of the world’s coffee supply. It is no coincidence that java is often used as a slang term for coffee. Speaking of coffee, today the Indonesians sell the most expensive coffee drink in the world, a drink called “kopi luwak”. A cat, called the Asian palm civet, consumes coffee berries and the enzymes in the civet’s stomach removes the bitterness from the coffee berry. Well, you can use your imagination on how the berries come out of the civet. These berries are sold for about $1000 per pound. The Indonesians were anxious for independence, which came after the Japanese occupation of Indonesia, from 1942 until the end of WWII, in 1945. The Dutch were unable to defend the colony from the Japanese, as they were under German occupation. At the end of the war and within days of the Japanese surrender, the Indonesians declared their independence. The Netherlands did not agree and a four year struggle ensued. They finally gave Indonesia their sovereignty in December of 1949. For years, Independence was still a struggle for the Indonesian people. After much strife, they finally were able to hold free elections in 1999. Today Indonesia is a huge melting pot of over 300 ethnic groups. The official language is Bahasa Indonesia but there are several hundred other local languages, like Javanese and Papuan. Most Indonesians speak their local language, as well as the official one. Indonesia’s climate is tropical, mostly hot and humid, as many of the islands lie right along the equator. They have two seasons, a wet and dry season but the temperatures do not vary much from season to season. They mainly stay in the low to mid 80’s year round. Cooler temperatures can be found at the higher elevations. The Indonesian archipelago is one of the most geologically evolving and diverse countries in the world. Over 150 of Indonesia’s 17,000 plus islands are active volcanoes. The, over 400, volcanic mountains that dot the islands, have a huge impact on both the Australian and Pacific tectonic plates. The islands are stretched out between the two plates and the area remains extremely active. Indonesia experiences at least one earthquake per day and three or so lesser vibrations. The Mount Tambora eruption that occurred in 1815 on the island of Sumbawa, was the largest observed volcanic eruption in history. The 2004 earthquake had a magnitude of 9.0 and created one of the world’s worst tsunamis ever. The epicenter was in Banda Aceh, Indonesia. In Indonesia alone, over 166,000 people died, over a half a million were displaced and 11 other countries were affected. On a personal note, when that tragedy occurred, I did not know much about Indonesia and I felt I needed to connect to the people and place. It was highly influential in why I started International Cuisine, to learn and understand more about the people and cultures populating our planet. The flora and fauna of Indonesia is astounding, being the second most bio-diverse nation on earth. There are about 28,000 species of flowering plants, with 2500 orchid species, 6000 traditional, medicinal plants, 122 species of bamboo, 350 species of rattan and over 400 types of rare woods. Tropical rain forests in the region are UNESCO World Heritage sites. Along with the flora and fauna, there are animals and birds, reptiles and fish that are equally astonishing. One of the most famous reptiles, resides on one island in Indonesia, and is known as the komodo dragon. This is only place in the world where this huge creature is found. Komodo Island is another UNESCO World Heritage site. As we look into the cuisine of this extremely diverse nation, it is easy to see the many different influences on their amazing food. 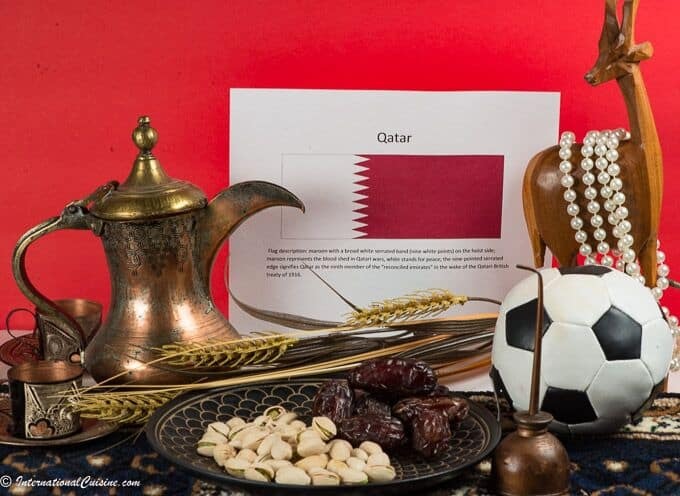 The Europeans, Arabs, Indians, South East Asians and the Chinese all contributed. Being located along the spice trade and with the natural resources that abound, the combinations are endless. 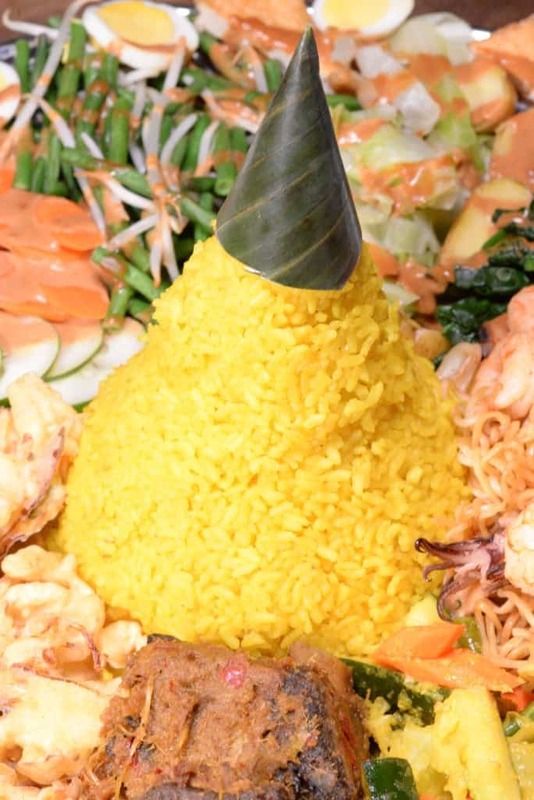 The foundation of any authentic Indonesian meal is rice called (nasi). Everything served with it is considered an accompaniment. Rice is grown in many areas throughout Indonesia, in the rich volcanic soil. 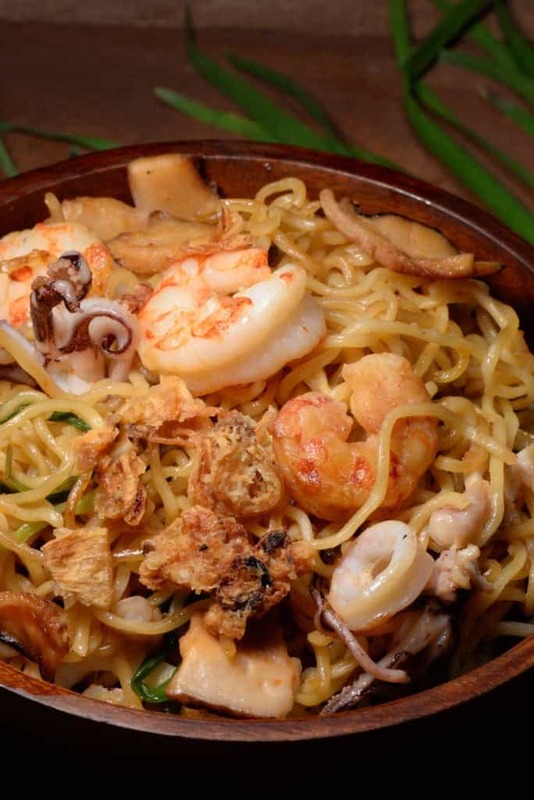 Indonesian cuisine is a combination of flavors, usually hot, salty, sweet and sour, all at the same time, which makes Indonesian food one of the most vibrant cuisines of the world. 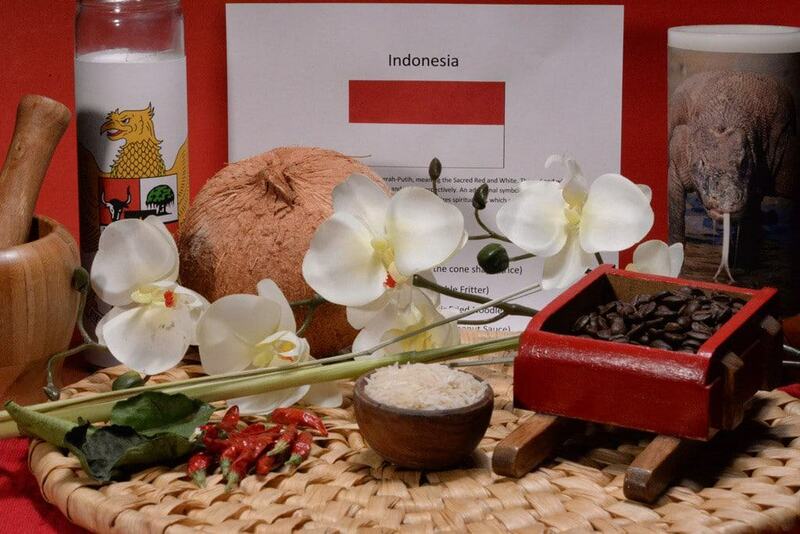 We set our low table with the colors of the Indonesian flag; red and white. We used banana leaves and bamboo mats to set the scene, along with orchids, coconut and candles, accented with a komodo dragon and the coat of arms. 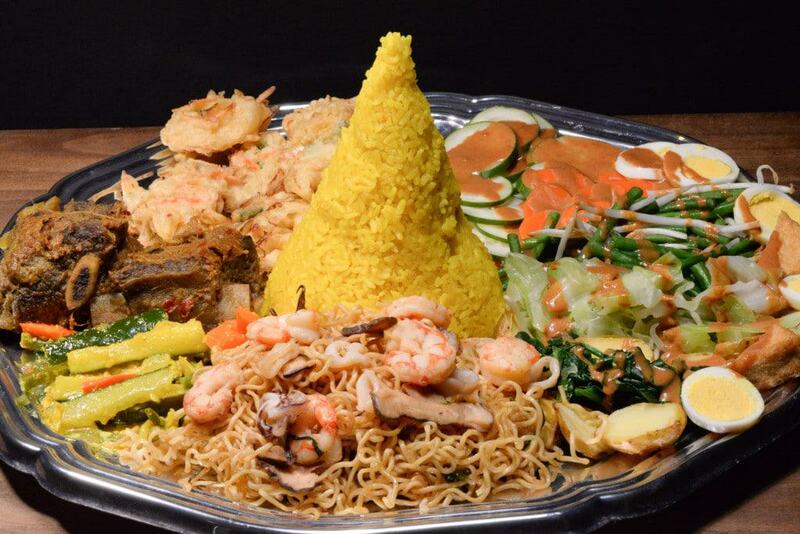 The platter, called Tumpeng, has a giant cone of rice in the middle of the platter. Tumpeng is served at many celebratory occasions. The cone represents the mountains. We sat on the floor and used only a spoon and fork, as would be customary in Indonesia. The rice was made with coconut milk and turmeric to give it a beautiful, yellow hue. Surrounding the Nasi Kuning were many delicious dishes. 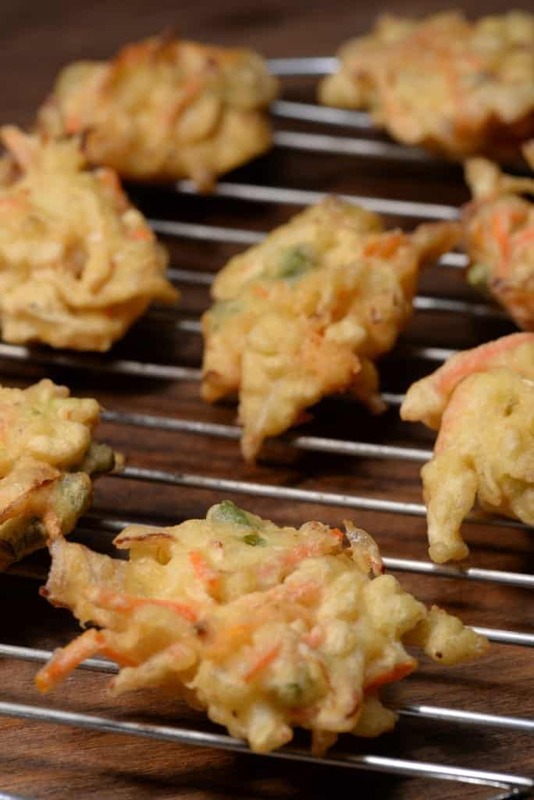 We began with the Bakwan Sayur, which is basically tempura like, vegetable fritters that were served warm and crispy. We devoured them. Next was the gado-gado. 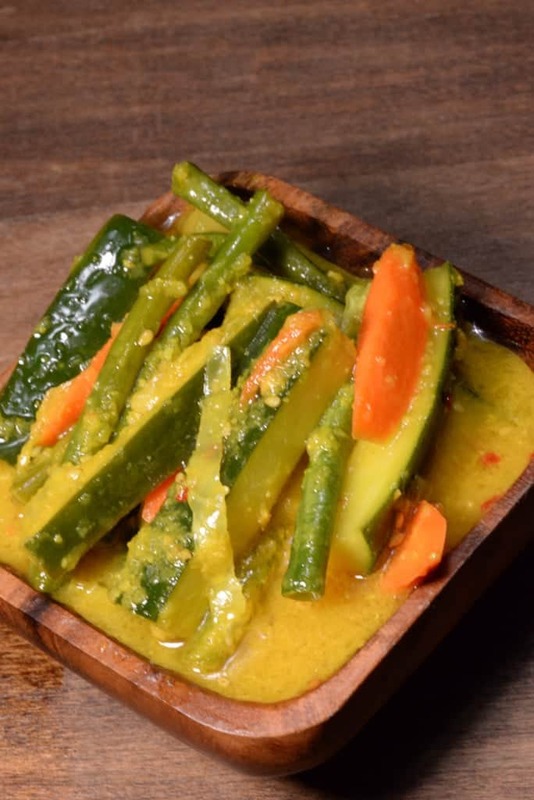 This dish is loved all over Indonesia, it literally means “mix, mix” so it can be made with any combination of vegetables (salad type ingredients, boiled, blanched and/or fresh) that you can imagine, but a few key ingredients are a must. The sweet and spicy peanut dressing is what makes this dish oh so delicious. 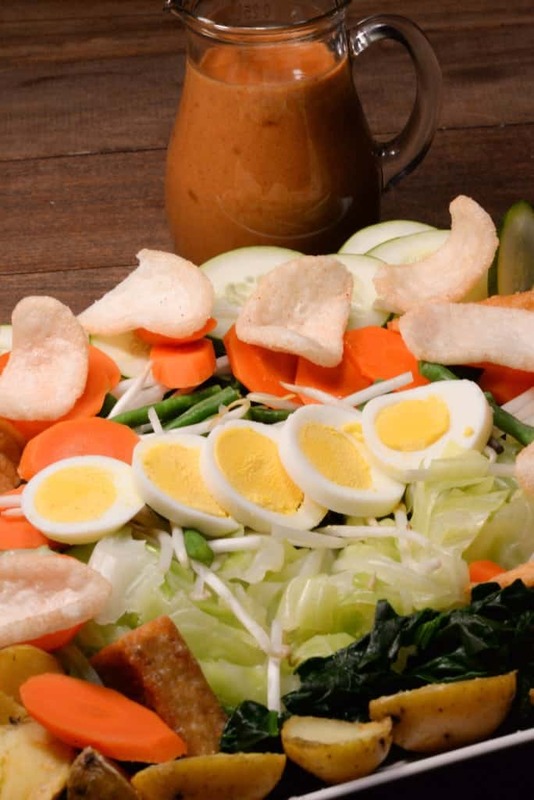 Hardboiled egg, tempeh and potatoes are also commonly used in gado-gado. It would make a lovely light meal for any occasion. We then enjoyed the seafood, stir fried, noodle dish called, Bakmi Goreng. This is an amazing dish full of robust flavor. The noodles are also a staple in their cuisine and one can imagine any number of uses for these delicious noodles. This dish had shrimp and squid as the seafood of choice and used a combination of hot chili sauce and sweet soy sauce, called Kecap. (Which, by the way, is how ketchup evidently got its name.) The sesame oil added a perfect essence and blended well with the mushrooms, onions and chives. The fried onions gave it a caramelized richness. Honestly, I have made this stir fry with all sorts of ingredients, multiple times, since our Indonesian meal. I am in love! Next was the dish called beef rendang. Red meat is not eaten very often in Indonesia but reserved for special occasions. 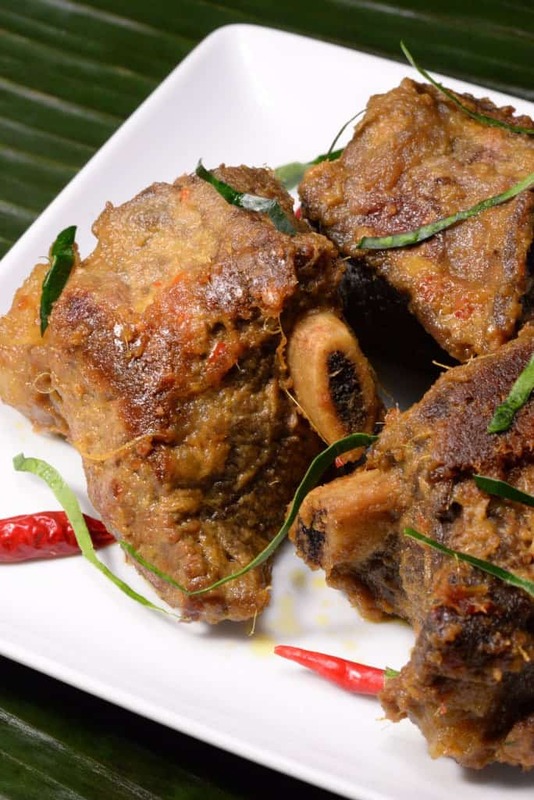 This traditional delicacy is made by slow cooking beef for hours in a rich, spiced, coconut sauce, until the beef has absorbed all the intricate flavors. It is cooked until perfectly tender and is a dish to be celebrated; simply outstanding. All these dishes were served with a condiment/pickle called “achar”. These are vegetables, pickled with a hot and sour sauce and provide a lovely bite to accompany just about anything or even eaten all by themselves. For dessert we savored dadar gulung. 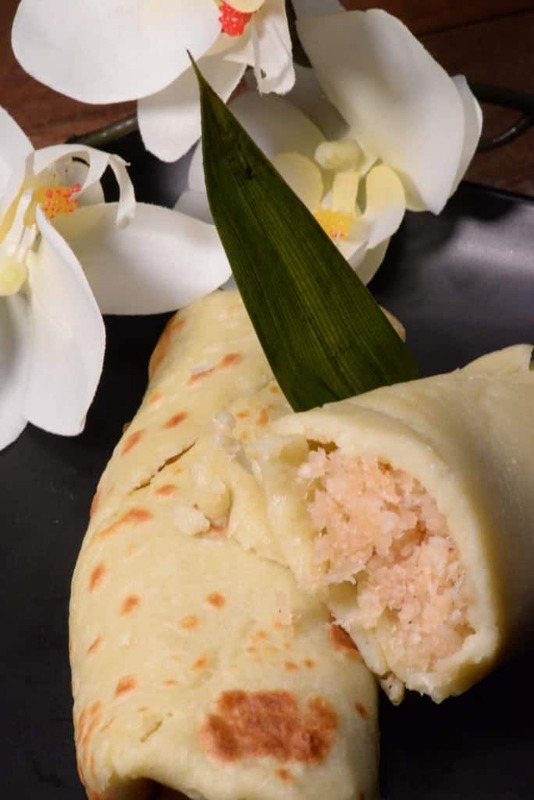 This is a caramelized coconut mixture, wrapped in a pancake, made with the flavoring of pandan leaves. It was a magical end to our Indonesian feast. As we say goodbye to these amazing islands and flavors of Indonesia, I do so with renewed hope. Just this past week, on December 2nd, there was a terrorist attack in the United States. It happened in San Bernardino, California and the attack is believed to have been inspired by radicalized jihadists. As Indonesia has also suffered terrorist attacks by radicals, I was moved to see that the government released a film called, “Rahmat Islam Nusantara” (“The Divine Grace of East Indies Islam”.) It has been translated into English and Arabic for global distribution. In a nut shell, the film challenges and denounces the ISIS interpretation of the Quran, as factually wrong and perverse. This strong message, coming from the most enlightened form of Islam in the world and dating back more than 500 years, is highly significant. It promotes a spiritual interpretation of Islam that stresses non-violence, inclusiveness and acceptance of other religions. Amen!